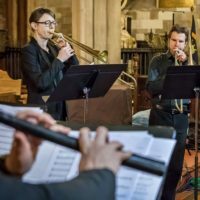 The English Cornett and Sackbut Ensemble is a virtuoso period instrument ensemble with a host of distinguished recordings to its name. Since its formation in 1993, ECSE has performed at many major music festivals in the UK and abroad. They have held sell-out concerts at London’s Wigmore Hall, St John’s Smith Square and the Purcell Room. Other performances include York Early Music Festival, Bath International Festival, Spitalfields Festival, La Folle Journée, Laus Polyphoniae, and the International Izmir Festival. ECSE regularly travels abroad with vocal ensembles inlcuding I Fagiolini, Alamire and Cantus Cölln. The group has appeared on numerous CDs. The Spy’s Choirbook with David Skinner and Alamire won the prestigious 2015 Gramophone Award for Early Music. Following the success of its 5-star debut CD Accendo (2001) ECSE has been involved in a variety of recordings. These include The Madrigal in Venice, a large-scale recording of Andrea Gabrieli’s madrigals with I Fagiolini. It was described as ‘one of the most enthralling madrigal anthologies on the market’. Its discography also includes the world premiere of Francesco Scarlatti’s ‘Miserere’ with Emma Kirkby and The Armonico Consort. It also includes a critically acclaimed Monteverdi’s Vespers of 1610, and a CD of music by the Flemish composer Philippe Rogier with the choir of King’s College London, directed by the late (and much missed) David Trendell. 2011 saw the release of Le Divin Arcadelt with Musica Contexta, and a further CD collaboration with I Fagiolini: the world premiere recording of the momentous 40-part mass Ecco si beato giorno by Alessandro Striggio, which scooped both the Gramophone Award for Early Music and the Diapason d’Or. ECSE has released two further solo discs. The first, entitled A Hanseatic Festival (2004) is a recital of German music. Flower Of Cities All (2008) features music from Shakespeare’s London. In 2012 ECSE gave solo recitals at the York Early Music Festival, Dartington International Summer School and Kings Place. The same year saw the release of two new recordings. Byrd’s Great Service with Musica Contexta (Chaconne), and the follow-up to the Striggio disc, entitled 1612 Italian Vespers with Robert Hollingworth and I Fagiolini (Decca). The latter was performed at that years BBC Proms. In 2013 the group also featured on a Peter Philips CD with the choir of Royal Holloway College (Hyperion). ECSE also works closely with other like-minded instrumental ensembles such as the Monteverdi String Band and the Altenburg Ensemble. They perform regularly with choral societies throughout Britain, including many performances of Claudio Monteverdi’s magnificent 1610 Vespers. ECSE members also perform individually with some of the worlds leading period instrument groups. Collaborations include Il Giardino Armonico, The Taverner Consort, Concerto Palatino, the Gabrieli Consort and Players, l’Arpeggiata, The English Baroque Soloists, King’s Consort, Ensemble La Fenice, Orchestra of the Age of Enlightenment and Tafelmusik. ECSE also provide music for plays at Shakespeare’s Globe Theatre on London’s Bankside.